The discovery of a gene mutation that causes a rare premature aging disease could lead to the development of drugs that block the rapid, unstoppable cell division that makes cancer so deadly. Scientists at the University of Michigan (U-M) and the U-M Health System recently discovered a protein mutation that causes the devastating Hoyeraal-Hreidarsson syndrome, a specific form of dyskeratosis congenital (DC), in which precious hematopoietic stem cells can't regenerate and make new blood. People with DC age prematurely and are prone to cancer and bone marrow failure. But the study findings reach far beyond the roughly one in 1 million known DC patients, and could ultimately lead to developing new drugs that prevent cancer from spreading, said Dr. Jayakrishnan Nandakumar, assistant professor in the U-M Department of Molecular, Cellular, and Developmental Biology. 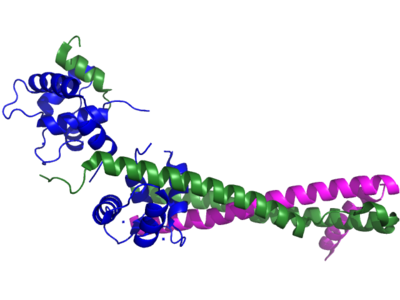 The DC-causing mutation occurs in a protein called TPP1 (image). The mutation inhibits TPP1's ability to bind the enzyme telomerase to the ends of chromosomes, which ultimately results in reduced hematopoietic stem cell division. While telomerase is underproduced in DC patients, the opposite is true for cells in cancer patients. "Telomerase overproduction in cancer cells helps them divide uncontrollably, which is a hallmark of all cancers," Dr. Nandakumar said. "Inhibiting telomerase will be an effective way to kill cancer cells." The findings could lead to the development of gene therapies to repair the mutation and start cell division in DC patients, or drugs to inhibit telomerase and cell division in cancer patients. Both would amount to huge treatment breakthroughs for DC and cancer patients, Dr. Nandakumar said. Every day, organ transplant patients around the world take a drug called rapamycin (image) to keep their immune systems from rejecting their new kidneys and hearts. New research suggests that the same drug could help brain tumor patients by boosting the effect of new immune-based therapies. In experiments in animals, researchers from the University of Michigan (U-M) Medical School showed that adding rapamycin to an immunotherapy approach strengthened the immune response against brain tumor cells. What's more, the drug also increased the immune system's "memory" cells so that they could attack the tumor if it ever reared its head again. The mice and rats in the study that received rapamycin lived longer than those that didn't. Now, the U-M team plans to add rapamycin to clinical gene therapy and immunotherapy trials to improve the treatment of brain tumors. They currently have a trial under way at the U-M Health System which tests a two-part gene therapy approach in patients with brain tumors called gliomas in an effort to get the immune system to attack the tumor. In future clinical trials, adding rapamycin could increase the therapeutic response. The new findings, published online on September 25, 2014 in Molecular Cancer Therapeutics, show that combining rapamycin with a gene therapy approach enhanced the animals' ability to summon immune cells called CD8+ T cells to kill tumor cells directly. Due to this cytotoxic effect, the tumors shrank and the animals lived longer. But the addition of rapamycin to immunotherapy, even for a short while, also allowed the rodents to develop tumor-specific memory CD8+ T cells that remember the specific "signature" of the glioma tumor cells and attacked them swiftly when a tumor was introduced into the brain again. Microbes – the single-celled organisms that dominate every ecosystem on Earth – have an amazing ability to feed on plant biomass and convert it into other chemical products. Tapping into this talent has the potential to revolutionize energy, medicine, environmental remediation, and many other fields. The success of this effort hinges in part on metagenomics, the emerging technology that enables researchers to read all the individual genomes of a sample microbial community at once. However, given that even a teaspoon of soil can contain billions of microbes, there is a great need to be able to cull the genomes of individual microbial species from a metagenomic sequence. Enter MaxBin, an automated software program for binning (sorting) the genomes of individual microbial species from metagenomic sequences. Developed at the U.S. Department of Energy (DOE)’s Joint BioEnergy Institute (JBEI), under the leadership of Dr. Steve Singer, who directs JBEI’s Microbial Communities Group, MaxBin facilitates the genomic analysis of uncultivated microbial populations that can hold the key to the production of new chemical materials, such as advanced biofuels or pharmaceutical drugs. “MaxBin automates the binning of assembled metagenomic scaffolds using an expectation-maximization algorithm after the assembly of metagenomic sequencing reads,” says Dr. Singer, a chemist who also holds an appointment with Berkeley Lab’s Earth Sciences Division. “Previous binning methods either required a significant amount of work by the user, or required a large number of samples for comparison. MaxBin requires only a single sample and is a push-button operation for users.” The key to the success of MaxBin is its expectation-maximization algorithm, which was developed by Dr. Yu-Wei Wu, a post-doctoral researcher in Dr. In a new study published online on September 22, 2014 in PNAS, researchers at the University of Alberta's Faculty of Medicine & Dentistry in Canada have explained how the function of a key protein in the heart changes in heart failure. Heart disease is the number-one killer in the developed world. The end stage of heart disease is heart failure, in which the heart cannot pump enough blood to satisfy the body's needs. Patients become progressively short of breath as the condition worsens, and they also begin to accumulate fluid in the legs and lungs, making it even more difficult to breathe. The molecular structure of the heart muscle changes as heart failure progresses, though scientists cannot always agree on what changes are good or bad. One change that occurs is an increase in "calcium sensitivity." Calcium ions are pumped in and out of the muscle cell with each heartbeat, turning contractions on and off. When the calcium sensitivity increases, contractility increases, but at a price: the relaxation of the heart becomes slower. Both phases of cardiac function are important: impaired contraction leads to systolic heart failure, while impaired relaxation leads to diastolic heart failure. Both types of heart failure are similar in terms of overall prevalence, symptoms, and mortality. Since 1976, medical researchers have known that the heart regulates its calcium sensitivity by phosphorylating a key cardiac protein called troponin I. The troponin complex is made up of three proteins, C, I, and T, which trigger muscle contraction in response to calcium. In heart failure, the phosphate groups are removed from troponin I, but it wasn't known how this caused an increase in calcium sensitivity. Dr.
University of Illinois (U of I) scientists have found compounds that boost liver detoxification enzymes nearly fivefold, and they've found them in a pretty unlikely place—the crushed seeds left after oil extraction from an oilseed crop used in jet fuel. "The bioactive compounds in Camelina sativa (image) seed, also known as “Gold of Pleasure,” are a mixture of phytochemicals that work together synergistically far better than they do alone. The seed meal is a promising nutritional supplement because its bioactive ingredients increase the liver's ability to clear foreign chemicals and oxidative products. And that gives it potential anti-cancer benefit," said Dr. Elizabeth Jeffery, a U of I professor of nutritional toxicology. Oilseed crops, including rapeseed, canola, and camelina, contain some of the same bioactive ingredients—namely, glucosinolates and flavonoids—found in broccoli and other cruciferous vegetables and in nearly the same quantities, she noted. Because the oil from oilseed crops makes an environmentally friendly biofuel, scientists have been hoping to find a green use for the protein-rich seed meal left after oil extraction. Animal feed was the obvious choice, but there were a couple of problems. Some rapeseed glucosinolates are toxic, and producers have balked at paying Canada for canola seed, the low-glucosinolate rapeseed that country had developed. Dr. Jeffery thought Camelina sativa was worth a look so she began to work with USDA scientist Dr. Mark Berhow. In the first study of camelina's bioactive properties, Dr. Berhow isolated four major components—three glucosinolates and the flavonoid quercetin—from its defatted seed meal. Back at Dr. Jeffery's U of I lab, researchers began to test these components on mouse liver cells both individually and together. Mountain pine beetles (image) get a bad rap, and understandably so. The grain-of-rice-sized insects are responsible for killing pine trees over tens of millions of acres in the Western U.S. and Canada over the last decade. But contrary to popular belief, these pests may not be to blame for more severe wildfires like those that have recently swept through the region. Instead, weather and topography play a greater role in the ecological severity of fires than these bark-boring beetles. New research led by the University of Wisconsin-Madison and the Washington State Department of Natural Resources provides some of the first rigorous field data to test whether fires that burn in areas impacted by mountain pine beetles are more ecologically severe than in those not attacked by the native bug. In a study published online on September 29, 2014 in PNAS, UW-Madison zoology professor Dr. Monica Turner and her graduate student, Brian Harvey, show that pine beetle outbreaks contributed little to the severity of six wildfires that affected more than 75,000 acres in the Northern Rocky Mountains in 2011. They also show that the beetle outbreaks, which occurred from 2000 through 2010, have not directly impacted post-fire recovery of the forests. The study does not, however, address fire behavior, such as how quickly fires spread or how dangerous they are to fight. While the findings may exonerate the insect scapegoats, they should also help ecosystem managers better respond to changes in the face of climate-driven disturbances, like drought and warmer temperatures. Large, severe fires are typical in the lodgepole pine forests found throughout the region, even without mountain pine beetle outbreaks. However, as the climate has warmed, outbreaks and big fires have both become more common. Sildenafil, the active ingredient in the erectile dysfunction drug Viagra®, could cause unusual visual responses in people who carry a common mutation for eye disease and may have long-term detrimental effects on their vision, University of New South Wales (UNSW) Australia researchers warn. Sildenafil can inhibit an enzyme which is important for transmitting light signals from the retina to the brain, and it is already known from clinical trials of Viagra® that its use in high doses can cause transient disturbances in the vision of some healthy people. "Side effects can include sensitivity to bright light, blurred vision, and altered color vision," says Dr. Lisa Nivison-Smith, of the UNSW School of Optometry and Vision Science. "We are concerned that people who have normal vision, but who carry a single copy of the mutant gene for the blinding disease, retinitis pigmentosa, could be more susceptible to these changes." A team led by Dr. Nivison-Smith and UNSW's Professor Michael Kalloniatis studied the effects of a single dose of sildenafil on normal mice and mice with a single copy of the mutant gene. The results were published online on September 17, 2014 in the journal Experimental Eye Research. They found the normal mice had a transient loss of visual function after sildenafil treatment, but this effect was heightened in the mice with the mutation, and the response lasted longer. They also found early signs of cell death in the eyes of carrier mice, but not in the normal mice, suggesting sildenafil may cause degeneration in carriers of retinal disease. "These finding are highly significant because about one in 50 people are likely to be carriers of recessive genes which cause retinal disease but are unlikely to know this, because their vision is normal," says first author of the study, Dr. Nivison-Smith.